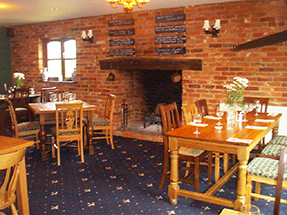 The Plough is an independent country inn where food, wine and real ales are our passion. We are close to Cambridge, Newmarket, Bury St Edmunds and Clare; ideal for a relaxing break. Our team of chefs are passionate about food and produce a selection of daily special dishes, along with a la carte menus that change with the seasons. We always aim to make the most of the best local produce, using local butchers, grocers and cheesemongers amongst our suppliers. In the bar, we serve local and national real ales. Our wine list is pretty comprehensive too, featuring current New World bins plus some European classics. When it comes to food,our kitchen team work hard to provide fresh, imaginative dishes, and are always happy to cater for any special dietary requirements. The menu is quintessentially British, with hearty country fayre. On the first floor, the en suite bedrooms have flat screen TV with digital channels, tea and coffee making facilities, WiFi connection throughout the inn (free of charge) and all rooms overlook the superb Suffolk countryside. We have beautiful gardens here at the Plough, overlooking the rolling Stour Valley. They are amazing in the summer months for dining or a long, cool drink. The gardens also provide a stunning location for marquee weddings, with such a wonderful backdrop for photographs of your big day. As a traditional country inn, we more than welcome dogs on a lead in the bar area and in the gardens at any time, and there is always a handy supply of Bonios behind the bar! 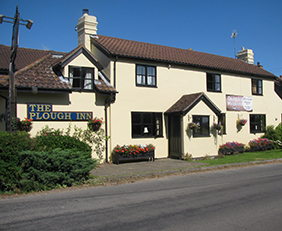 The Plough Inn is conveniently located for Haverhill, Sudbury, Lavenham, Bury St Edmunds, Newmarket and Cambridge. Besides the beauty of the Suffolk countryside, other attractions include Bury St. Edmunds Cathedral, Long Melford Hall, Freeport Shopping Designer Outlet at Braintree, Newmarket Racecourse and the National Museum of Horseracing plus the beauty, history and great shopping of Cambridge. We are always delighted to discuss any special requirements, party bookings or events that you may be planning. Bank Holiday times may vary- please call us to confirm. Please note that we do not accept cheques as a method of payment. Apologies for any inconvenience this may cause.